The TAMU pathobiologist leading the BRD study is Dr. Jim Womack, whose area of expertise is mammalian genomics. 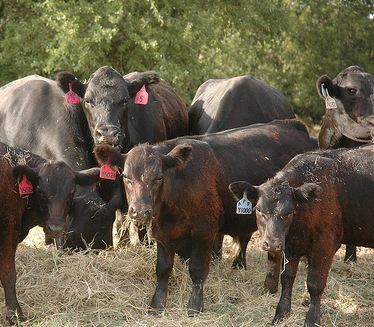 Bovine Respiratory Disease is a general term for a range of respiratory ailments (a "disease complex") that beef and dairy cows contract through a combination of pathogens and an immune system weakened by stress. About 1 in 10 cows will come down with the illness, and though it is not fatal, it weakens the animal and requires veterinary intervention. Because the complex can be caused by such a variety of pathogens, Womack's approach will be to identify the genetic makeup of those cows that don't tend to get sick and compare that genetic data with that of the cows that are sick. In this case, the team will analyze the DNA of some 6000 feedlot cows to determine which have the best innate immunity. Armed with this information, farmers can make better breeding decisions that will ultimately result in a stronger herd and fewer cases of BRD among individuals. "This project undoubtedly has the potential for major scientific advances enabling more efficient and cost-effective cattle production. I'm very excited about the opportunities it will offer to the beef industry." An extensive new veterinary medicine building is currently under contruction at the University. See our earlier blog for details. 09/19/2013 11th Annual San Antonio BioResearch Product Faire™ situated on the University of Texas Health Science Campus.